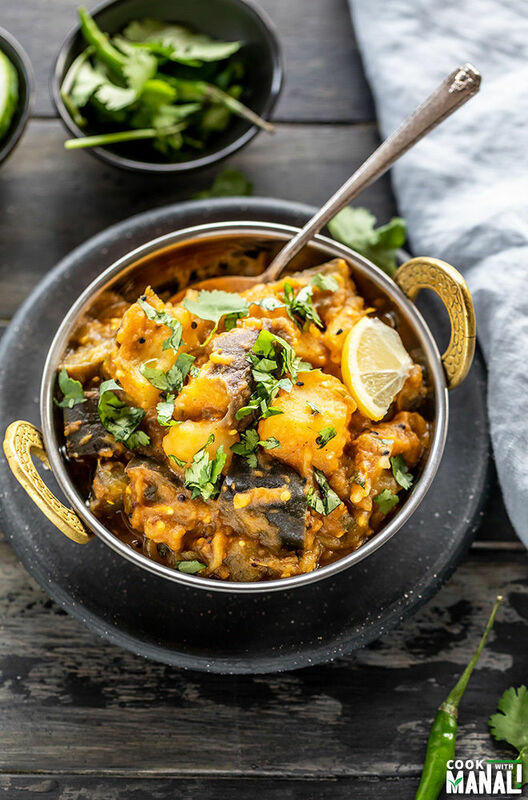 Instant Pot Aloo Baingan – simple potato and eggplant curry made in the pressure cooker. This easy recipe uses my frozen onion tomato masala and gets done in 20 minutes! Talk about easy dinner! If you love all the Instant Pot vegetarian/vegan recipes that I share on the blog, please join me on this Facebook Group – Instant Pot Vegetarian Recipes. The group shares/features vegetarian instant pot recipes and ideas from all around the web! 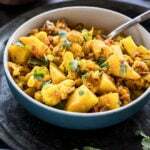 The next recipe using the onion tomato masala is this aloo baingan. Do you guys like eggplant? I have always liked it but I know a lot of people who do not enjoy it. Sarvesh likes it only in bharta form. By the way you guys should totally check out my baingan bharta recipe, it’s my favorite and so good. I personally love eggplant in every form. Whether it’s made the Indian way or in Eggplant Parm or Borani Banjan, I like them all! What’s your favorite way to eat eggplant? I would love to know. As a kid, I ate eggplant only in 2 basic ways- one in bharta and one was this aloo baingan. At my home, aloo baingan always had a tempering of panch phoran. What exactly in panch phoran? It’s an Indian five spice blend which is used a lot in Eastern India. The spice mix has cumin seeds, mustard seeds, fennel seeds, nigella seeds and fenugreek seeds. I have used panch phoran in this recipe but if you don’t have it, simply use cumin seeds in place. It will work fine. 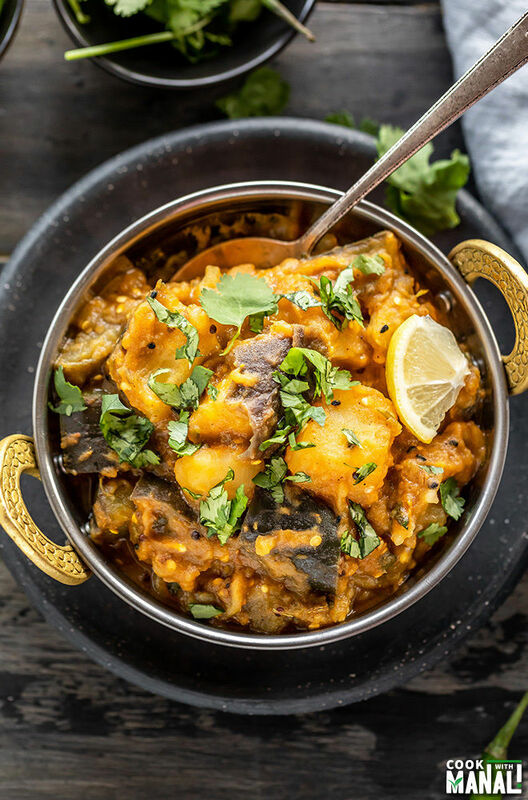 This instant pot aloo baingan recipe is incredibly easy to make. I used my frozen onion tomato masala and after that I only had to add the veggies and let the pot do it’s thing. I also added just a bit of garam masala and salt but always be careful since the frozen masala already has spices and salt in it so you only have to add little while making the dish. ✓ gets done is 20 minutes! I know you guys like easy recipes and I love them too. That’s why I thought of sharing super easy recipes with you guys this year. Having frozen onion tomato masala in your freezer would make your life so easy. Just trust me on that. 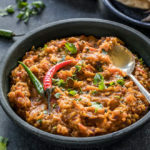 If you have no time to cook from scratch every day, just make a big batch of this masala over the weekend and freeze it. That way with the help of your Instant Pot, you can have fresh meals with in minutes over the weekdays! With the Instant Pot, you always have to be careful about the way you chop your veggies else they can turn mush. 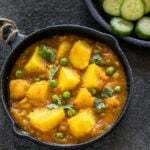 How to make sure your aloo (potato) and baingan (eggplant) don’t turn it into a mush in this recipe? Make sure to chop them big. If you fine chop them, it will all turn mush. I really hate it when veggies turn mush in the IP. So make sure you chop them into big – 1 to 1.5 inch pieces for this recipe. Hope you guys are enjoying these easy recipes and they are helpful to you. I would love to hear your feedback! 1- Press the saute button on the Instant Pot. Once it displays hot, add oil to the pot and then the panch phoran mix. Let the seeds sizzle & splutter (especially mustard seeds) for few seconds. If you don’t have panch phoran, just use 1 teaspoon cumin seeds. 2- Then add the onion tomato masala (I used frozen straight from the freezer) and 1/2 cup water. 3- Add the potato, eggplant, cilantro, salt and garam masala in that order. Do not stir. Close the pot with its lid. Press the manual or pressure cook button and cook on high pressure for 3 minutes. Do a quick pressure release by moving the valve from sealing to venting position. 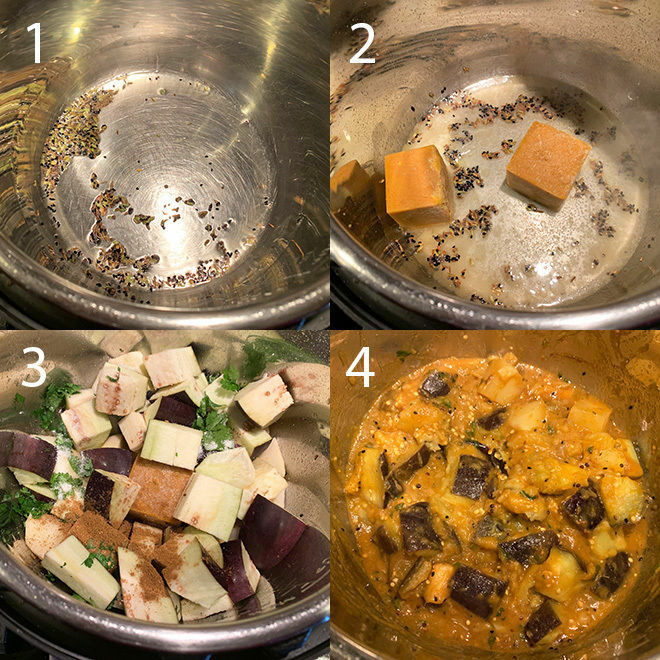 4- Open the pot, using a spoon stir the potato and eggplant with all the spices until combined. Add in lemon juice and mix. 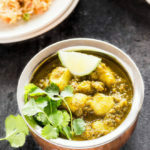 Garnish instant pot aloo baingan with more cilantro and serve with roti, rice or paratha! 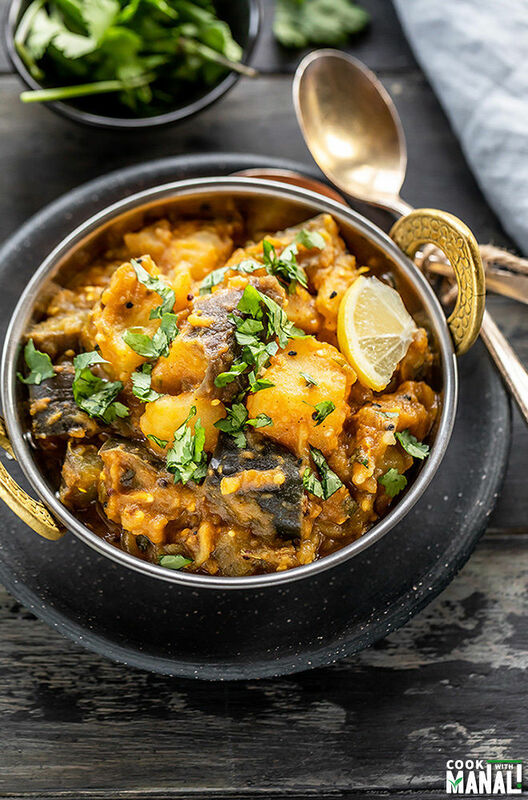 If you’ve tried this Instant Pot Aloo Baingan Recipe then don’t forget to rate the recipe! You can also follow me on Facebook, Instagram to see what’s latest in my kitchen! 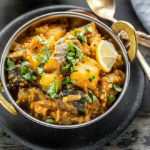 Easy Aloo Baingan (potato & eggplant curry) made in the Instant Pot! This recipe uses frozen onion tomato masala and gets done in 20 minutes for an easy dinner! Vegan & gluten-free. Press the saute button on the Instant Pot. Once it displays hot, add oil to the pot and then the panch phoran mix. Let the seeds sizzle & splutter (especially mustard seeds) for few seconds. If you don't have panch phoran, just use 1 teaspoon cumin seeds. Then add the onion tomato masala (I used frozen straight from the freezer) and 1/2 cup water. 3- Add the potato, eggplant, cilantro, salt and garam masala in that order. Do not stir. Close the pot with its lid. Press the manual or pressure cook button and cook on high pressure for 3 minutes. Do a quick pressure release by moving the valve from sealing to venting position. Open the pot, using a spoon stir the potato and eggplant with all the spices until combined. Add in lemon juice and mix. This looks really good! Seems like there’s a lot of flavor in this. I really want to try this now, thank you! Hi Manali. I am curious – why do you recommend not stirring after putting in the ingredients in step # 3? so that the eggplant doesn’t get very mushy. If submerged with everything else, the eggplant gets mushy pretty soon. Of course I want it to be cooked and well done but not like a mash as we make in bharta so that’s why I asked not to stir. You may stir of course, no problem! I made your onion masala, and really want to do this now. Can I use bell peppers instead of eggplant? Would I vary cook time? Thanks Manali! Do post more recipes using this masala! Yes! I did the dal the day before yesterday! I love your flavors. I also love your butter paneer recipe and just ordered your book on Amazon. Lol. Clearly I’ve just discovered you. Hey can I use any canned beans for that black eyed peas recipe? How does that change cook time? Thanks Aruna! I hope you enjoy my cookbook 🙂 You can use canned beans, cook for 10 mins at high pressure then with natural pressure release. I love it, Manali. Everything I’ve tried from the book turns out great and the instructions and substitutions are very easy to follow!